Home → Weatherization → Chimney Sealing → Chimney Balloon Fireplace Draft Stopper - 9 in. x 9 in. Chimney Balloon Fireplace Draft Stopper - 9 in. x 9 in. To insure you order the correct size, measure the length and depth of the location within the flue where you will be installing a Chimney Balloon. 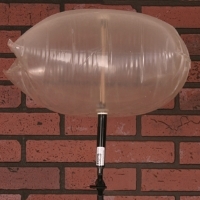 Order a Chimney Balloon that is up to 6 inches larger in either dimension than your measured opening. The location for the Chimney Balloon should be an area that is not interfered with by the damper flap or other hardware, and must have at least 6" in height of parallel or slightly sloping walls with sufficient texture for the balloon to grab and lodge in during inflation. This fireplace balloon measures 9" x 9".